Here is a great deal on a brand new redesign. The Ithaka replica is Odysseus style rebuildable. The redesign includes a insulated center pin which everyone said was missing in the last version. In 2014 Provape will be releasing some new combinations for the Porvari. They promise to have many different color combinations. There are also rumors that Provape is working with Evolv on a project. What that project is – I wont talk about until I get some more information. Provape has denied this is true. Provape is running a sale for 24 hours. All items are discounted! 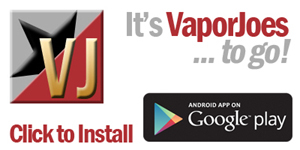 If you were looking to buy a provari – now would be the time. Provape does not issue coupons often. Both the Zombie and Stainless Steel editions are IN STOCK! 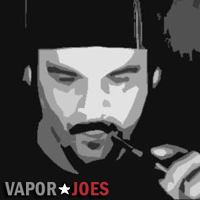 USE COUPON CODE PROVAPE2014 TO GET YOUR DISCOUNT! Vision has always been known for quality. They were brought us the original CE4 (aka Stardust) and the original Vivi Nova tank – changing the tedious to a simple fill a vape. They have now started getting into the variable wattage market and are bringing us a Vamo at a great price! The vamo is a tried and true variable wattage mod. $28.50 from the USA is a great deal! This is a New and Awesome VV mod from Vision. The Vision Variable Volt Mod has multiple configurations available giving a large amount of functionality and flexibility. With a gun metal finish, the Vision Variable Volt Mod is comfortable to hold and easy to use. The Vision Variable Volt Mod can show battery volts and atomizer/cartomizer ohms. It has a 5 Click on/off feature. With a sealed 510 recessed eGo connector it maximizes the number of different cartomizers or tanks you can use. Great for use with tanks and eGo cartomizers. It is approximately 137mm tall with a 22mm diameter. Every time these hit eBay at this price – they sell out very quick. 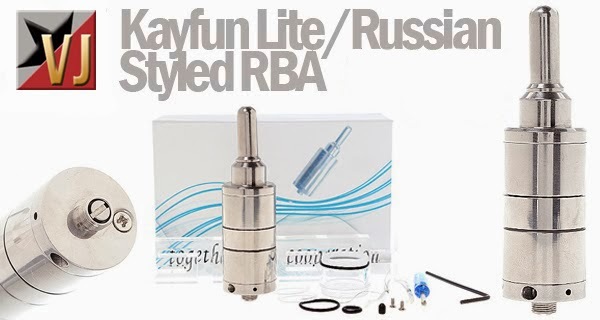 This atomizer seems to have been inspired both by the popular SvoeMesto Kayfun Lite and the Russian 91%, as it features the look and finish of the Kayfun, but has the added bonus of airflow control and a bottom screw fill hole like the Russian 91%. Here’s a great chance to try this style of vape at a steal of a deal. Can it get any cheaper? 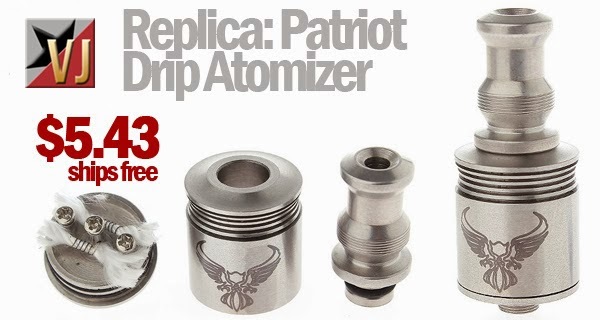 One of the most attractive replica drippers we’ve seen, this new one dubbed the “Chi-Triot” was inspired by the popular Patriot Dripper. It’s constructed of stainless steel and features a deep drip well with a three post configuration ideal for thirsty dual coil builds. Holes through the posts and phillips screws mean it’s an easy build and won’t have you hunting for allen keys. Drip tip is included. Here is a new player in the ejuice market looking to gain some business. The Vape Tree is running a 50% off sale on all their juice. I have never tried their juice, but I plan to with a sale like this. You need to put $15.00 or more in your cart to get the 50% off coupon to work. Its a great way to try out a new juice vendor. I own a real Kraken from vicious ant, yesterday at a vape meet I saw the clone. UNBELIEVABLE. I couldn’t tell them apart. Its like they are made in the same factory. American vendors have had this China replica for a while, however now Fasttech has jumped on board with a KILLER price point. Usually a replicated mod starts from a China site. 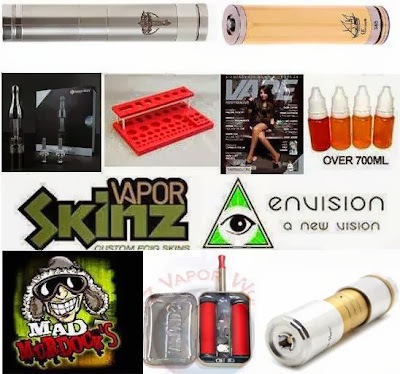 However, today 101vape is debuting the Turtle Ship at a incredible low price. Just $31.99. One of the most anticipated mechanicals to come in a while. The main 18350 tube of the Turtle Ship clone features the signature UVO Korean laser etched engravings on both the front and back side. 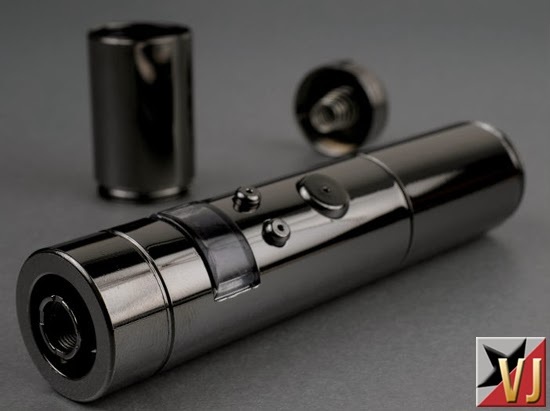 The Turtle Ship clone is composed of 100% stainless steel and comes with a total of 3 battery tubes to be able to easily change the length of your device and to accommodate an 18350, 18490 or 18650 batteries. The Turtle Ship clone mod has a brass atomizer contact pin and a brass bottom firing pin for ultimate conductivity. The white delrin ring on the Turtle Ship clone’s button allows you to adjust the delrin piece upwards/downwards to eliminate any unwanted battery rattle inside the mod. 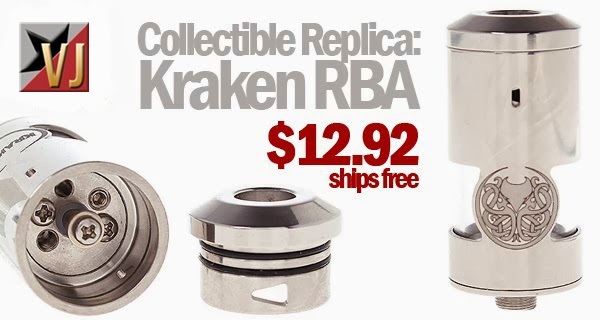 The Turtle Ship clone features a locking ring to allow the mod from any unwanted firing when placing it in your pocket or setting it down on a table. The Turtle Ship clone has a 510 atomizer connection which will fit most atomizer and is 22mm in diameter. Hope Eliquids is running a 40% OFF SALE. Now would be a great time to stock up on your favorites or give them a try! It doesn’t get cheaper then this. The sale runs through the 31st. Some of my personal favorites is “Heard it through the Grape Vine” and “Coconut Cream Pie”. 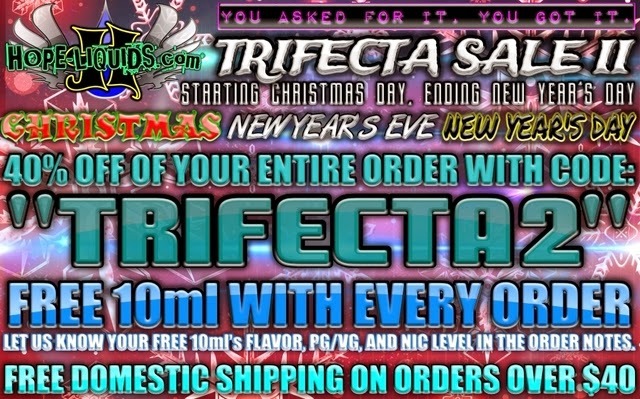 USE COUPON CODE TRIFECTA2 FOR 40% OFF YOUR TOTAL ORDER. FREE 10ML BOTTLE WITH EACH ORDER – NO MINIMUM. This is a New and Awesome VV mod from Vision. The Vision Variable Volt Mod has multiple configurations available giving a large amount of functionality and flexibility. 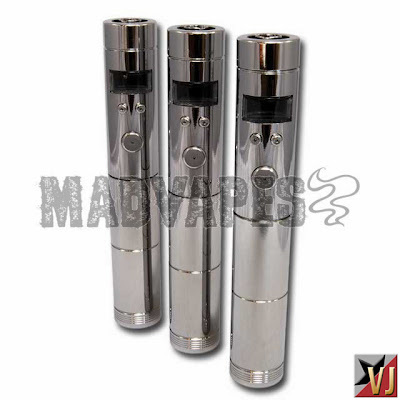 With a chrome finish, the Vision Variable Volt Mod is comfortable to hold and easy to use. The Vision Variable Volt Mod can show battery volts and atomizer/cartomizer ohms. It has a 5 Click on/off feature. With a sealed 510 recessed eGo connector it maximizes the number of different cartomizers or tanks you can use. Great for use with tanks and eGo cartomizers. It is approximately 137mm tall with a 22mm diameter. The door busters are over but the coupon remains. As of today the coupon that gives you 5-10% off all items is still active. 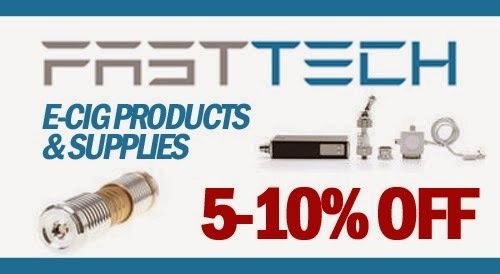 Its been a very long time since Fasttech allowed a coupon code for e-cig related items – so now would be the time to pull the trigger on what you have been waiting to buy. Use coupon code XMAS to get 5-10% off your total order. I called it! Like I said in the predictions for 2014 post – 26650 is going to be the new baby. Here is the first 26650 variable wattage mod from China. This thing is a MONSTER, and it will sell like crazy. 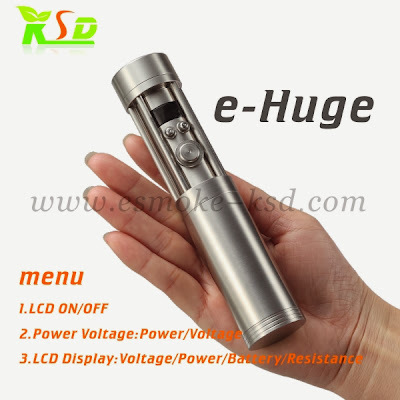 Finally a 4000+ mAh variable wattage device! The next issue is the price. How much? Im hearing around $65.00 which is reasonable. Let the CoOps and merchant orders begin! The M-16 mechanical has been one of the most popular mechanical mods to date. This version is made by HCigar – known for their high quality standards. These are made of stainless steel with a brushed finish. The contacts are silver plated for very little voltage loss. Shipped from the USA at an incredible price! The HCIGAR Sentinel M16 has silver-plated contacts. The logo and the serial number are laser-etched. This can be used with an 18650 battery with a kick. This is a telescopic mod, and a clone of the Grand Vapor edition Sentinel M16. Battery Compatibility: 18350, 18500, and 18650 battery.